Maelstrom Wanderer’s pilot was on a “Farewell Tour” of his decks, playing them all one last time before taking them apart to rebuild (which is a very foreign concept to me… take decks… apart?). Roon was the third of the rebuilt C13 decks the other guy had been playing (see the previous games vs. Marath and Prossh). I started with a Tormod’s Crypt and a Hanyku and 3 lands. Roon had a Mother of Runes (if she were a rhino, would she be a Mother of Roon’s?) and a Solemn Simulacrum. Malestrom had an early Urza’s incubator (elemental) and soon a Paleoloth. I added silly stuff like Norwood Archers, Icatian Phalanx, and cool stuff like Magewright Stone. Roon played a Progenitor Mimic on the Simulacrum… I think…, Malestrom played Cryptic Command followed by Incendiary Command, which wheeled away my Akroma’s Memorial. Roon continued to play a bunch of little value guys, as well as an Aura Shards (Which shut all of the cool enchantments I had in hand right down). Maelstrom started doing tricks with Crackleburr. 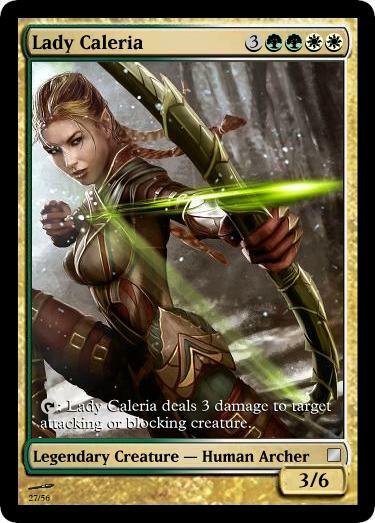 I’m able to play Lady Caleria, but she gets bounced by the Crackleburr. I block with banding to kill the Wanderer. Roon now has a Deadeye Navigator and a Hornet Queen and a Seedborn Muse (and then another one), so Maelstrom Wanderer just up and kills Roon. When he comes after me Lady Caleria is at least able to double shoot and kill an Intet. Then Wanderer casts Hypergenesis: I play my only card, an Umbral Mantle, and he plays Riku, followed by a doubled Plated Slagwurm, a doubled Garruk’s Horde, a doubled Engulfing Slagwurm and more stuff. I die horribly. It was fun. I’m glad Maelstrom Wanderer went out with a savage bang. Since my first days of Summer Camp, I’ve always loved archery. Thus an Archer Tribal deck was an inevitability (despite what Andy of CommanderCast thinks, archers are a the-bomb tribe). Banding was my favorite keyword, way back in the day, so since Archers don’t quite fill out an EDH deck, I let that be a sub-theme. Also a few Elves that don’t mind untapping (and I might add Midnight Guard for the Presence of Gond combo). Decent equipment to give deathtouch or other damage-triggered abilities, and tricks to untap for maximum shootage. This entry was posted in Game Review, loss and tagged 2-color, fun, GreenWhite, loss, Tribal by nickel97. Bookmark the permalink.